The very spacious and cozy apartment with three bedrooms located on the 1st Floor of the centrally located house in a very green garden, directly over the port and the center. Access from the parking area (road) above the house is over the outside stairs and from the port (below the house) over the footpath and the outside stairs. Opposite the entrance is the furnished grill terrace (seating for 6 people), that can be readily used by arrangement. On the grill terrace is a stone sink with running water and a shower. This side of the garden faces s mall park and is very green and shady, ideal for an afternoon coffee. A LED / satellite TV and a holiday library with books in several languages (German, English, French, Italian), mostly thrillers and 'beach literature', as well as various travel guides, city guides, maps and road maps (for Rabac and Labin, but also Istria and Croatia) are available. The rocking chair is ideal for reading. Bathroom with shower / WC, bidet and washing machine + an extra WC with a small washbasin. The living area with an open kitchen has about 40 square meters and exit to the balcony (sea view). The fully equipped kitchen (plenty of dishes and many cooking utensils, a 4-plate electric stove with oven, refrigerator with a 50-liter freezer, coffee maker, 2 toasters and a kettle) offers enough storage space and has exit to the balcony, which is furnished with a large wooden table, 2 armchairs and a wooden bench. A sun shield is also available. The living room with the open kitchen and the large, partially covered balcony offer a romantic view of the sea, the old part of Rabac and the old town of Labin. A LED-SAT/TV, internet (via the public HG Spot Rabac) and the air conditioning make this comfortable apartment with soul very coz and warm. We stayed at this apartment last weekend with six people and a baby. Even with some many people, we all felt like we had enough space. It was very clean and cozy and the owners were very friendly and helpful. It has a small fully stocked kitchen with all the basic kitchen utensils. The view from the balcony and windows was unbelievable. The apartment is located a short distance from the bay where you can find restaurants, a grocery store, and some amazing beaches. 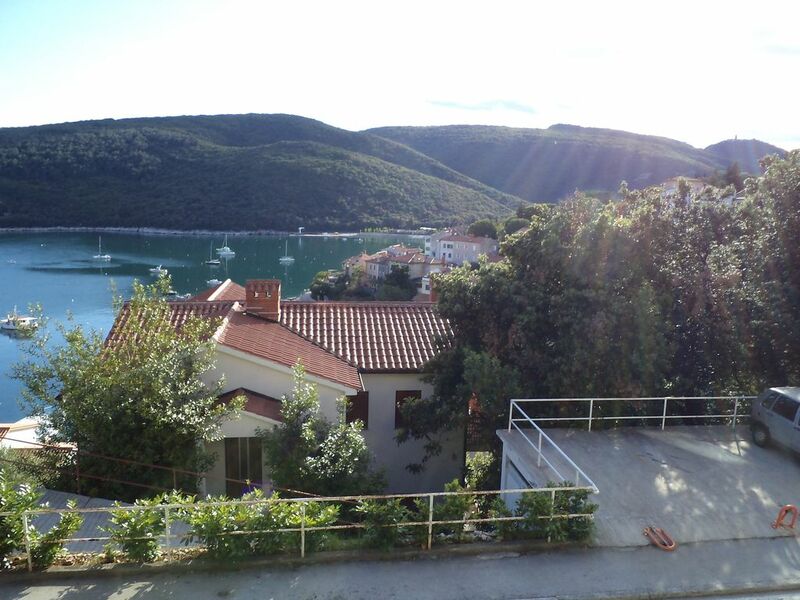 I would highly recommend this apartment if you are interested in staying in Rabac. Gerade aus Rabac zurück und zu Hause angekommen haben wir uns entschlossen die Wohnung für nächstes Jahr erneut zu buchen. Es war alles Perfekt. Der Balkon läd zu einem langen Frühstück ein, die Sonne stört nicht da ein großer Baum genug Schatten spendet. Die Wohnung ist sauber mit einer guten Ausstattung für alle Koch Liebhaber. Einer der besten Kroatien Urlaube seit 9 Jahren, weil rundum alles passte. Für uns war wichtig auch Boote selber zu chartern um die schöne Gegend vom Wasser aus zu erkunden. Traumhafte Lage mit wunderschönem Meerblick, Einrichtung etwas älter, aber alles Wichtige ist vorhanden, super Unterkunft mit großem Balkon, sehr nette Vermieterin, die sich liebevoll um das Wohl der Gäste kümmert. Rabac ist ein schöner Ferienort, der zentral auf der Halbinsel Istrien liegt. Von Rabac aus kann man tolle Tagesausflüge unternehmen und so das wunderschöne Istrien, mit seinen wunderbaren Zielen, erkunden. Es lohnt sich aber auf jeden Fall auch in Rabac zu verweilen, da dieser Ferienort viel zu bieten hat. Die FW ist super und bietet einen unvergesslichen Ausblick über den Hafen von Rabac. Einen besonderen Dank an die Hausherrin, für ihre einmalige Gastfreundlichkeit. Sind zum ersten Mal in Rabac, Istrien, Kroatien. Die einmalige Landschaft, die malerischen Gebäude und natürlich das Essen haben uns überzeugt. Die Unterkunft (Haus) besticht durch Sauberkeit und angenehmes Raumgefühl. Das Haus ist gut ausgestattet, es fehlt an nichts. Der Weg zum Wasser ist nicht weit, denn das sollte man schon berücksichtigen. Ein Aufstieg bis an die obere Stadtregion von Rabac, Rabac liegt am Hang, kann schon beschwerlich und lang werden. Uns hat der Urlaub gefallen. Rabac, a former fishing village on the eastern coast of Istria, is today a renowned tourist resort. Because of its mile-long small -gravel and rocky beaches, and the lush vegetation, it is known as 'the pearl of the Kvarner Bay'. Situated between the beautiful city of Pula (45 km) with many sites from the Roman period (including the best-preserved Roman amphitheater) and Rijeka (60km), a large city with mediterranean charm, Rabac is an ideal holiday-resort for everyone. It is ideal for a family vacation at one of the many smaller or larger beaches, which are often surrounded by cliffs, with crystal clear water, which is checked daily, because all the beaches of Rabac have the Blue Flag - the symbol of the highest water quality and best beach facilities. The more than 5 km long and varied coastline promenade passes through the village, almost all of its many cafes, bars, restaurants, ice cream parlors and shops, but also by a fragrant pine forest and greenery. The seafront promenade is ideal for an evening stroll under the stars, and unbeatable as a morning jogging route, which ends with a jump into the blue sea and / or a coffee in the harbor, which already smells like fresh bread from the bakery ... Rabac is just as well suitaqble for sports or active leisure seniors. Particularly attractive are the marked trails and bike routes that lead through all the beautiful nature and reward the hiker / cyclist with breathtaking views of the Bay of Kvarner with islands of Cres and Losinj. In the village itself and the surrounding area there are excellent sports and recreational facilities (tennis, hiking, sailing, fishing, surfing, water skiing, scuba diving, paddle boating, snorkeling, , paint ball, riding ...), spa, fitness and wellness centers and indoor swimming pools and saunas. It is also possible to book diving courses or to take boat trips or rent a motor boat (even hourly) . You can shop for food there (supermarkets, fruit and vegetable shops, bakeries, pastry shops ...) and the pharmacy, bank, doctor, ATMs, post offices, travel agencies, etc. It is advisable to do weekly shoppings in Labin (5 km away ), where there are several shopping centers (including Lidl). Particularly attractive is the daily (even on Sundays!) open indoor market with fresh local vegetables and fruits, but also fish and meat. Rabac was actually the port of the medieval town of Labin, which rises above the bay of Rabac. The historic old town of Labin can be reached by a beautiful hiking trail through the woods (past a small freshwater lake), but also by car or the local bus. The old town of Labin is a city of art - this picturesque town is home to a colony of artists and there are many studios and galleries. Museums, churches, restaurants, cafes, small shops, antique markets and especially the fantastic panoramic views are definitely worth a visit. A special attraction for children is the replica of a mine in the local museum. It is a city with soul and atmosphere in which you always feel well. Attractive is also the lead in the English language through the old town of Labin at night. Other notable attractions nearby are the Sculpture Park Dubrova, the old city Kršan etc. IRabac is a very good starting point for trips of any kind - by car, bus or boat - the islands of Cres and Losinj (Dolphin-Center) Krk and Rab are definitely worth a visit as are the famous Brijuni islands, the cities of Porec and Rovinj ... even Trieste and Venice are popular as a half day or full day excursion, as well as the Postojna Cave in Slovenia or the Plitvice lakes in the inland of Croatia (a UNESCO nature park). Very close is the highest mountain in Istria - Ucka - that is also a nature and wildlife park. . To Opatija, with its hotels, restaurants and casinos, there are about 40 km along the beautiful coast road that runs through many small villages with many good restaurants, views and beaches. In the vicinity of Rabac there are several wine routes (wine tasting), many restaurants with local Istrian cuisine, some top restaurants when it comes to seafood, and attractive agro-tourism services (olive oil tasting tours, for example). In the summer, many events take place at the Port Rabac concerts, dances, food festivals, wine tasting, etc. Eine Anzahlung in Höhe von 25% des Mietpreises innerhalb 10 Tage nach Erhalt des Mietvertrags und der Rechnung mit den Bankdaten. ONLINE - Zahlungen sind möglich! Restmiete auch in 2 Teilzahlungen möglich; 1. Teilzahlung 45 Tage vor Mietbeginn; 2. Teilzalhung 2 Wochen vor der Anreise, oder bei Anreise in bar. Die Preise gelten für die Wohneinheit und BIS ZU 5 PERSONEN. Für die 6. Person (Zustellbett) werden zusätzlich 15 Eur/Nacht erhoben. Im Preis inbegriffen: Kurtaxe, Wasser- & Stromkosten, INTERNET (WiFi), Waschmaschine, Abstellraum für Fahrräder, Endreinigung, Parkplatz; Bettwäsche. ZUSATZKOSTEN: behördliche Anmeldung 4 Eur/Person einmalig, bei Anreise; Klimaanlage 5 Eur/Tag, Haustier 5 Eur/Tag. Aufenthalt unter 4 Tagen - 30% teurer.